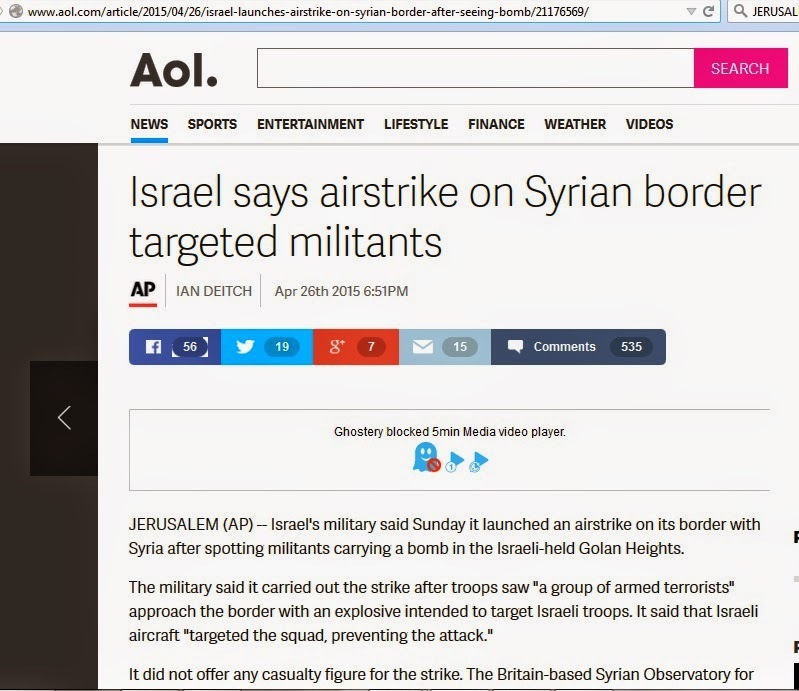 "Israel Launches Airstrike On Syria Border"
But is that really what happened? Of course not. JERUSALEM (AP) — Israel's military said Sunday it launched an airstrike on its border with Syria after spotting militants carrying a bomb in the Israeli-held Golan Heights. The military said it carried out the strike after troops saw "a group of armed terrorists" approach the border with an explosive intended to target Israeli troops. 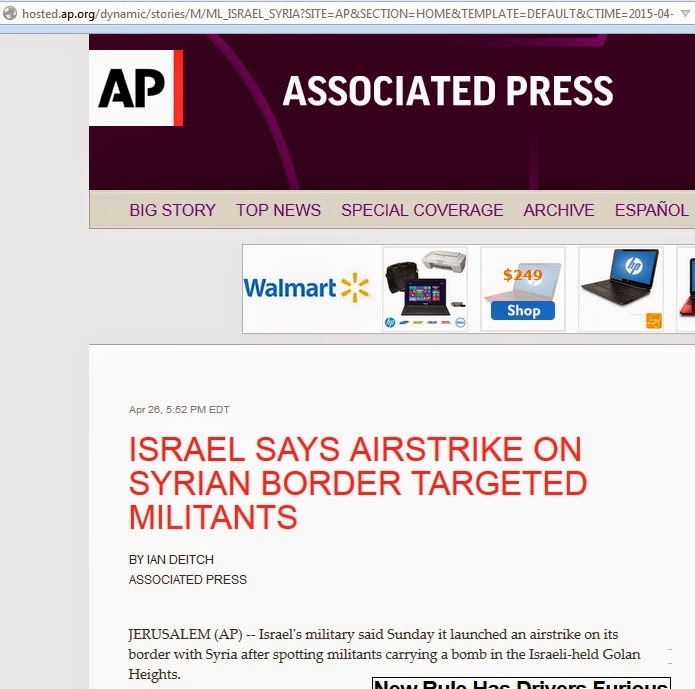 It said that Israeli aircraft "targeted the squad, preventing the attack." Oh, so this defensive military action was precisely targeted, and intended only to prevent any more Israeli soldiers or civilians from being murdered in similar fashions (as in recent incidents here, here, and elsewhere). 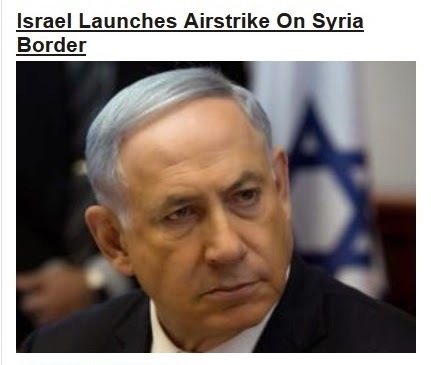 Yet HuffPost took that headline and deliberately rewrote it in such a way as to give anyone who casually glances at its front page, or its news feed, the false impression that Israel attacked Syria for no reason. This journalistic malpractice feeds the radical Islamist lie that Israel is the main aggressor in the Middle East, and that jihadis are justified in defending themselves against its unprovoked violence. So why would Arianna choose to rewrite the AP's headline to incite hatred against Israel, and Prime Minister Netanyahu, on such an easily-disprovable basis? (1) Because she and her minions at HuffPost have gotten away with doing this, and far worse, to Israel and Jews for many years. (2) Because no one will hold her to account --- not AOL, not other "journalists," and not the "journalism" schools to which she frequently lectures. "It's like when a toddler looks right at you and slowly and deliberately spills a glass of milk. The child wants to see the reaction. It's a test of boundaries. If there's no reaction, then the message is that it's OK."
Thanks to the complicity of the "news" media, and even those at the highest levels of the Jewish community, however, Arianna and HuffPost keep getting away with inciting hate against Israel (and Netanyahu). And being that HuffPost is the #1 most-read online "newspaper" in the world, which has repeatedly claimed to be "nonpartisan," it has become a major driving factor in the dramatic rise in global anti-Semitism and anti-Israel hatred. How does this all compare to Arianna Huffington's claims that HuffPost is a professional "newspaper," and better than its competitors? “[T]oo many reporters have forgotten that the highest calling of journalists is to ferret out the truth, consequences be damned." (2) Consider writing or calling one or more of HuffPost's top advertisers, to let them know your thoughts on what their ad dollars are enabling.An easy way to approach this is to scan our easy-to-use directory and find one or two corporations that you are a customer of, or have stock in. Your concerns will automatically be given considerably more weight. Also, request a follow-up after they've had a chance to review the evidence; don't let them off the hook, or sweep this under the rug. (3) Forward the link to this story along to others who support honest civil discourse (especially honest journalists).